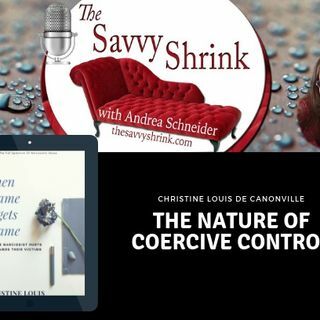 Christine Louis de Canonville and Andrea discuss the nature of coercive control and how narcissists use this form of extreme emotional and psychological abuse to ensnare their victims. Christine is a Psychotherapist, Educator, Author and Supervisor of mental health professionals for over 28 years. She was part of a team in the Trauma Unit of St. Brendan’s Psychiatric Hospital, Dublin, and has worked specically with victims of pathological narcissistic abuse in her private practice for many ... See More years. Her books, “The Three Faces of Evil: Unmasking the Full Spectrum of Narcissistic Abuse” and “When Shame Begets Shame: How Narcissists hurt and shame their victims” set out to to help those who have been affected by a narcissist and also to address the shortfalls in a therapist’s education, so that they become better equipped to work with survivors of narcissistic abuse.Much of her knowledge has come from her post-grad studies in Criminology and Forensic Psychology, and it is through these disciplines that she has gained her understanding of “The Dark Triad”, (Narcissism, Machiavellianism and Psychopathy). These three faces of evil are vital information for understanding the full spectrum of narcissistic abuse and the dire effects on the victims.It is her vision that narcissistic abuse becomes part of the curriculum of all Mental Health clinicians. Her website is www.narcissisticbehavior.net.